Part #3 - Is the rate of sea level rise accelerating? But what about Church & White? 159 tide stations with long (avg. ~85 year) Mean Sea Level (MSL) measurement records were selected by NOAA for long term trend analysis, and constitute the best of the GLOSS-LTT designated tide stations for monitoring long term sea level trends around the world. A spreadsheet containing the Local MSL (LMSL) trend data for those stations is available on the noaa.gov web site. (The data for 114 of the tide stations are maintained by the PSMSL in the UK, and the rest are maintained by NOAA in the USA.) I downloaded the spreadsheet and used the data to check the IPCC's claim that sea levels rose ~18 cm during the last century (a rate of 1.8 mm/year). Furthermore, the IPCC's claims that the rate of sea level rise is accelerating, and that the acceleration has been confirmed by coastal tide gauges, are also untrue. In fact, tide gauge measurements indicate that the global average rate of sea level rise has not measurably accelerated in more than a century. NOAA has more detailed information for each tide station, including graphs of the LMSL trends, here. For the 114 PSMSL tide stations, see their web site for more information, here. For all but a few locations, the latitude and longitude listed were identical in the two sources, but a few locations were listed in only one of the two documents, or were listed with very slightly different coordinates in the two sources. In the later case, I averaged the differing coordinates; coincidentally, in all such cases the difference between the two sources was either 1, 3 or 5 minutes of latitude or longitude, so the average shown on the Global MSL Trend Table page ends in ".5" minutes. The numbers in red are values which I calculated from the other data. Note: The portion of the Global MSL Trend Table page preceding the red line is in Microsoft Excel 2000 HTML spreadsheet format. So if you want to load the data into a spreadsheet you can just load the web page into Excel (version 2000 or later). Doing so will mangle the formatting of the text after the red line, but the data and formulas above the red line will load correctly, and the numbers will be represented with greater precision than is shown on the web page. 159 stations are listed by NOAA. They've been in operation for an average of ~85 years. Local Mean Sea Level (LMSL) rose at 117 locations, and fell at 41 locations. The location with both the greatest total increase and fastest rate of increase was Galveston, TX, USA, where mean sea level rose about 63 cm (2.1 feet) over a period of 99 years. The location with the greatest total decrease was Vaasa, Finland, where mean sea level fell by about 91 cm (3.0 feet) over 124 years, but the location with the fastest rate of decrease was Furuogrund, Sweden, where mean sea level fell at a rate of 8.17 mm/year (2.68 feet/century) over 92 years. The location with the median rate of LMSL change was Prince Rupert, Canada, where MSL rose at a rate of 1.09 mm/year (0.358 ft/century). Only 52 of 159 locations had LMSL rates of increase which were greater than the IPCC's claimed global average of 1.8 mm/year. At 65 of the remaining 107 locations, the LMSL trend was up, but by less than 1.8 mm/year. At one location the LMSL trend was flat (neither up nor down). At the other 41 locations, the LMSL trend was down. There are two simple, obvious ways of averaging the LMSL trend numbers, and I've done both. One way is to weight each measurement location equally. The other way is to weight each station-year equally; that is, to weight each measurement location according to how long it was in operation, so that a station which was in operation for 100 years would have twice the weight of a station which was only in operation for 50 years. It turns out that it doesn't make much difference in the result. The average MSL change is +0.611 mm/year if each station is weighted equally. The average MSL change is +0.458 mm/year if station-years are weighted equally. A less obvious way of averaging the LMSL trend numbers is geographically: i.e., by weighting the tide stations in sparsely sampled areas of the earth more heavily than those in areas which have many tide stations. To do that properly, we must first know something about the granularity of the physical mechanisms (such as postglacial crustal rebound) which cause LMSL trends to vary between locations. In other words, how near must two tide stations be to each other for their LMSL trends to be more closely correlated than are the LMSL trends measured at stations which are widely separated? To weight tide station locations by distance, on the basis of the above graph, note that correlation weight W must be = 1 when distance D is 0, and W = 0 when distance D is greater than 800 km. Or, in terms of the graphs, W = 1 when Y = 0.00, and W = 0 when Y = 3.00. Read the 159 GLOSS-LTT tide station records, noting the Local Mean Sea Level (LMSL) trend for each station and the station's coordinates. For each tide station location, check the location against every other location, calculating the distance D between the two locations, and the correlation weight W calculated from the distance according to the piecewise-linear approximating function (above). Also, for each tide station location, sum the correlation weights of all nearby tide stations. The result is a geographically-weighted global average linear MSL trend of +1.133 mm/year (4.46 inches/century) ± 0.113 mm/year (95% confidence interval). I also tested a wide range of other hypothetical maximum distances of Local MSL trend correlation. None of them resulted in a weighted average linear MSL trend of more than about +1.2 mm/year. The Perl program to perform these calculations and the .csv data input file are both included in the aforementioned code.zip archive. Detailed instructions for how to run the program and duplicate these results (using either Windows or Linux) are here. According to NOAA's data, averaged several ways, global mean sea levels have been creeping up at a rate of at most about 1.1 mm/year (4.5 inches per century). That is only two-thirds of the 1.7 to 1.8 mm/year rate which the IPCC claims. 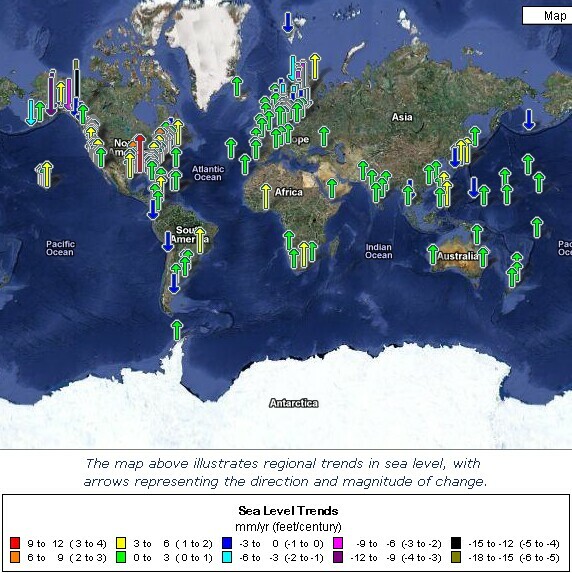 Although the global average rate of MSL change is, at most, only about 1.1 mm/year, most sites have historically seen larger changes than that, because the average includes both locations where the sea level is increasing and locations where the sea level is decreasing. The "Absolute value of MSL Trend" column shows how much sea level change (up or down) is experienced by each site, and the average is about 2.07 mm/year (8.16 inches/century). That means much (probably about half) of the LMSL trend at most sites is due to local conditions, rather than the global MSL trend. The significance of that fact is that it means changes in the global average rate of MSL rise are of much less significance than you might expect. This is shown by the 9th-12th columns, in which the effect of hypothetical increases in rate of global MSL rise are calculated. In fact, for 37 tide station locations which have been experiencing large decreases in sea level, a 0.6 mm/year (>50%) increase in the global average rate of MSL rise would actually reduce the rate of Local MSL change experienced at those locations. For locations which have been experiencing increases in sea level, an increase in the global average rate of MSL rise would increase the amount of change experienced at those locations, but often by a relatively small amount compared to the change which they have already been experiencing. 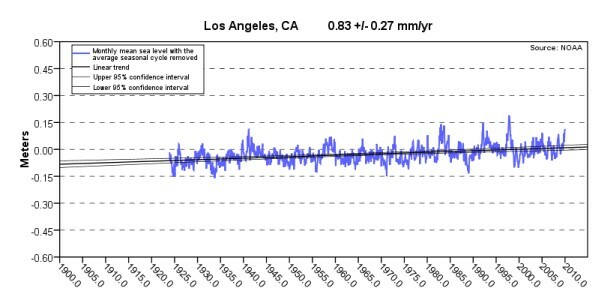 In the columns labeled "MSL Trend +0.6mm/yr" and "Absolute value of MSL Trend +0.6mm/yr" I calculate the local effect at each station of a 0.6 mm/year (i.e., more than 50%) increase in rate of global average mean sea level rise. The average amount of change (up or down) experienced by the 159 locations would increase from the 20th century rate of 2.07 mm/year to about 2.40 mm/year, which is just a 16% increase. 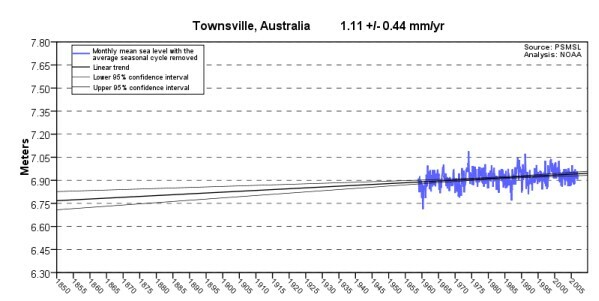 In the column labeled "MSL Trend +1.2mm/yr" I calculate the local effect at each station of a 1.2 mm/year (more than 100%) increase in rate of global average mean sea level rise. The average amount of change (up or down) experienced by the 159 locations would increase from 2.07 mm/year to about 2.78 mm/year, which is still only a 34% increase. Because of the large variation in rate of sea level change between different seaside locations, changes in the global average rate of sea level increase have much less effect on seaside communities than one might guess. Even more than doubling the global average rate of Mean Sea Level rise would cause only a 34% average increase in the rate of sea level change experienced by seaside communities. "Satellite altimetry... shows that since 1993, sea level has been rising at a rate of around 3 mm/yr, significantly higher than the average during the previous half century. Coastal tide gauge measurements confirm this observation..."
But there are major problems with that conclusion. First, there is good reason to question the correctness of the corrections and averaging methodology which Church & White applied to obtain global averages from the tide gauge data. What that sounds like to me is that they got the "wrong" result, so they added a fudge factor! Second, even if we accept their data, their conclusions are wrong. They admitted that “no 20th century acceleration has previously been detected” by other researchers. That obviously suggests that somebody must be wrong, either Church & White or those other researchers. That's a major understatement! Actually, according to their data, there was no acceleration at all in the rate of sea level rise over the last 70 years of the 20th century. All the 20th century acceleration occurred before 1930. Though you won't read it in their paper, according to their data & methodology, since 1930 the rate of sea level rise has actually decelerated! Yet they still wrote, “If this acceleration remained constant...” when they obviously knew the acceleration hasn't remained constant, and in fact ceased entirely, more than 70 years ago! The fact that sea levels began to rise (slowly) in the late 19th century, following the end of the Little Ice Age, is well known, and uninteresting. That rise is continuing. The interesting question is how much acceleration occurred later, after humanity began producing CO2 at dramatically increased rates. The answer (which you won't find in Church & White's paper) is little or none. The bottom line is that, even according to Church & White's data, sea level rise has been essentially linear for the last century, even though CO2 emissions have gone up dramatically. The record of the 20th century gives no reason to expect a significant acceleration in the rate of sea level rise during the 21st. The IPCC's claim that "coastal tide gauge measurements confirm" an accelerating rate of MSL rise is nonsense. 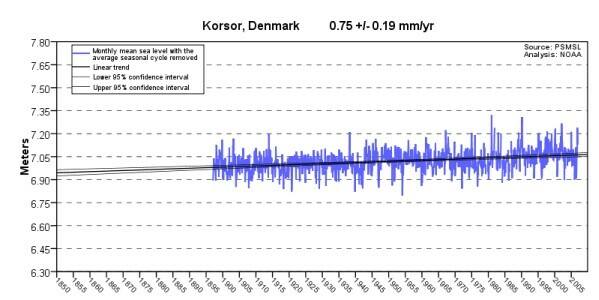 If the global MSL trend had actually accelerated by about +1.3 mm/year since 1993, as the IPCC claims, that fact would be apparent at these tide stations, as a doubling or tripling of the measured rate of MSL rise. But there is no evidence of any such acceleration. The global average Mean Sea Level has been rising at a slow, steady rate of less than 1.2 mm/year for more than a century – i.e., since long before there was any major human contribution to atmospheric CO2 levels. The obvious conclusion is that anthropogenic CO2 does not appear to cause a significant increase in the rate of sea level rise. The obvious question is, "How did the IPCC's AGW alarmists get it so wildly wrong?" Or, first off, is it possible that the IPCC is right? For instance, is it possible that the GLOSS-LTT list of 159 locations is so unrepresentative of the world as a whole, that it drastically understates 20th century global average MSL rise?" So how did the IPCC get it so wrong? The answer, at least in part, is that they've been adjusting the numbers with "correction factors" for vertical land motion, based on theoretical models (or here) rather than actual measurements, and their corrections greatly inflate the reported rate of sea level rise. Unfortunately, it seems that their models are better at correcting for upward land movement (post-glacial rebound) than for downward land movement (coastal subsidence), which biases their results. "The impression has been conveyed to the world's public, media, and policymakers, that the sea level rise of 18 cm in the past century is an observed quantity and therefore not open to much dispute. What is not widely known is that this quantity is largely the product of modeling, not observation, and thus very much open to dispute, especially as sea level data in many parts of the world fails to live up to the IPCC claims." This paper is long, but very readable, and well worth careful study. Here's a short link to this page: http://tinyurl.com/MSLavg2.